On our Macbook Air (Mid-2011 11", OS X 10.9.5 Mavericks), starting a few days ago, every time we open Finder windows, the right side just shows screen artifacts/cheese. File Open dialogs in MS Word work fine - it is just the Finder windows with the problem. I have tried rebooting, and Verify Disk in Disk Utility. Neither helped. Maybe I should upgrade to El Capitan? But why would this start happening all of a sudden? A number of users who have upgraded their precious Macs to Apple’s newest OS, namely OS X Mavericks have found that when they log into their systems, the Finder windows no longer run stably. Instead, it quits and relaunches repeatedly. This problem has also been mentioned again and again on Apple Support forum threads, including here and here. 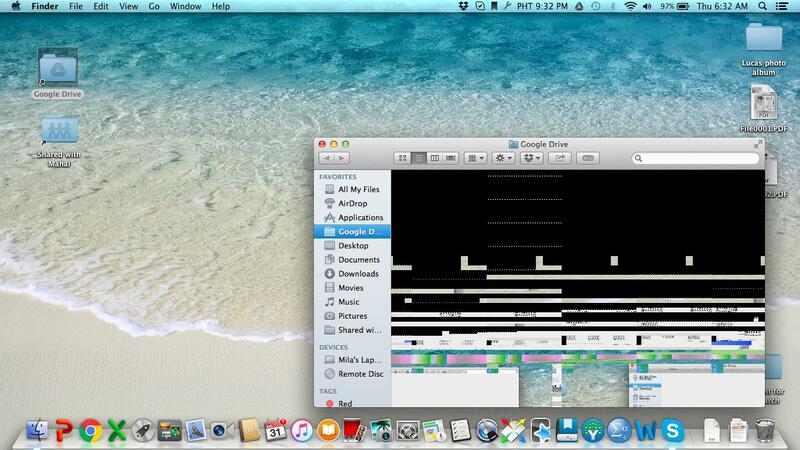 When this problem occurs, all Finder windows and desktop items disappear, and then after a little while, reappear. This specific problem appears to be related somehow to Google’s desktop client (current version 1.12, released on September 25) for accessing its Google Drive service. Whenever Google Drive synchronises, the folders that you have set up to sync should be showing a small sychronization icon next to them. It appears that the way Google Drive adds these sync icons to folders is the issue that is crashing Finder windows in Mavericks. Click the Google Drive menu and choose Preferences. Uncheck the option to “Show file sync status icons and right click menu” in the Preferences window. I did that, and no more screen artifacts/freezing. Not the answer you're looking for? Browse other questions tagged macbook mavericks screen graphics . How to fix OS X Finder window with file/folders panel that doesn't draw itself?